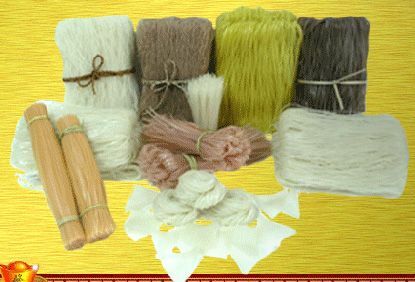 There are noodles made from other ingredients such as sweet potato flour, buckwheat etc. Shapewise, they maybe flat, round, thick, thin, you name it ! In Southeast Asia, there are many freshly made noodles available such as Kway Teow/Hor fun (flat rice noodles), mee hoon/mai fun (rice noodles) and mee (egg/oiled noodles). Seen the Dutch historic connection to present Indonesia, the meehun is locally written as "miehoen"
Made from pure white rice and water ( rest moisture 6-10 %), so gluten and wheat free pasta, without any chemical components like colorings or preservatives or enriched with calcium and iron, produced by most modern automatic machines and dried by means of closed baking under stringent hygienic and controlled environmental to international standard which maintains its original quality of rice nutrition value and its natural fragrance. The main features of this product are low calories and no cholesterol. 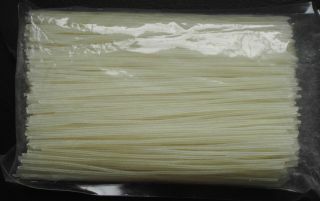 Rice vermicelli is widely used in oriental cuisine in soups and stir-fries but suitable for all worldwide consumers as noodle in soup, mixed with salad, fry with meat or shellfish and vegetable or cooked instead of spaghetti and etc. First soak the rice vermicelli in normal temperature water for 5 - 10 minute and drain. Stir-fries the other ingredients, add the rice vermicelli and some broth, cover and simmer. The rice vermicelli will absorb the broth and the other flavors. 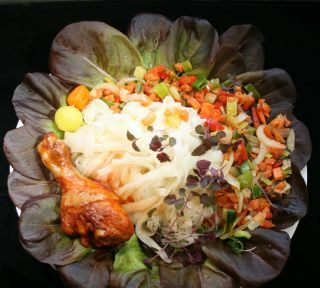 Fine rice stick noodles can also be deep fried to create a crispy garnish often used in Chinese chicken salads. 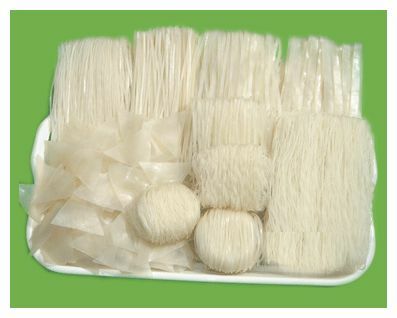 Packed in 12 -24 - 40 packs per crt, in 200 - 250 - 400 - 500 g for home use and 3 - 5 kg bulk for the gastronomy, from thin threads up to sticks of 1 - 2 - 3 - 5 mm. Udon is a type of thick wheat-flour noodle popular in Japanese cuisine. Udon is usually served hot as noodle soup in a mildly flavoured broth. The flavor of broth and topping are various. Usually, dark brown broth, made from dark soy sauce, and light brown broth, made from light soy sauce. The origin of udon in Japan is credited to Buddhist priests who traveled to China. Like many other noodles, udon noodles are served chilled in the summer and hot in the winter. Toppings are chosen to reflect the seasons and to balance with other ingredients. Most toppings are added without much cooking, although some are deep-fried. Many of these dishes may also be prepared with soba. Soba is a type of thin Japanese noodle made from buckwheat flour. It is served either chilled with a dipping sauce, or in hot broth as a noodle soup. Moreover, it is common in Japan to refer to any thin noodle as soba in contrast to udon which are thick noodles made from wheat. 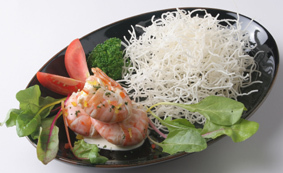 Soba contains a type of polysaccharide that is easily digested and assimilated. 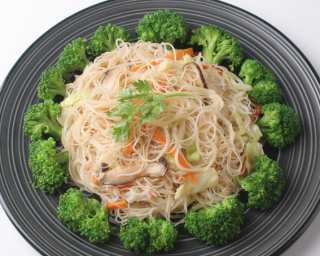 Soba noodles also contain rutin, an antioxidation ingredient, one of the flavonoids, and choline. Rutin helps to prevent high blood pressure so it reduces risk of heart disease. 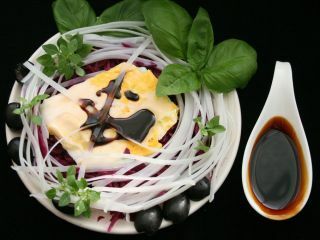 Soba has other antioxidation ingredients beside rutin, notably quercetin, proto catechu aldehyde. Choline is needed to make acetylcholine, which is used in the brain and affects memory and intelligence. Soba also contains many water-soluble vitamins like thiamine (about twice that of polished rice) and riboflavin. 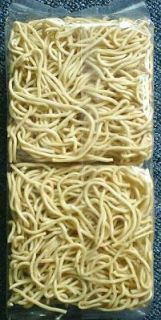 S�men is very thin, white Japanese noodles made of wheat flour. 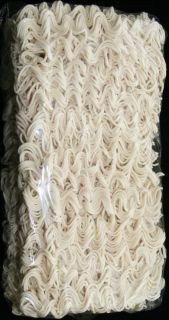 The noodles are usually served cold and are less than 1.3 mm in diameter. 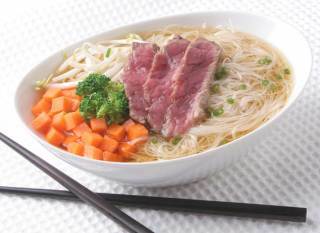 S�men are usually served cold with a light flavored dipping sauce. S�men served in hot soup is usually called "nyumen" and eaten in the winter, much like soba or udon are.